I went on a shopping trip last week and bought several new items, including Coffret d'Or's new "Beauty C Curve Eyes" eyeshadow palette in 03 Monotone Blue. The reason why I decided to get it was because when I was at the hair salon, I read a magazine where they used this palette and a blue Anna Sui liner, which looked really nice and summery. 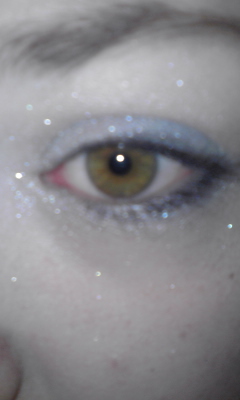 I don't have the liner yet, but I will post pics of the complete eye look when I have it. 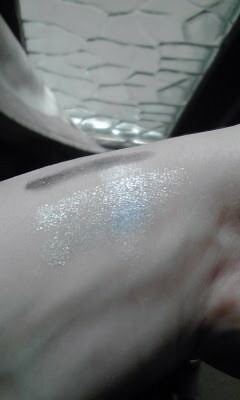 As almost all Japanese eyeshadows, the colours are on the sheerer side, and they have lots of shimmer. I prefer this look to bold and matte colours, especially when it comes to blue, a colour that can easily look overdone if you aren't careful. The liner shade is pretty pigmented and dark, but when you use it close to the lashline, it looks really nice. The white "C Curve" is supposed to go around the outer corner of your eye to brighten it up, but I'm sure you can also use it in the inner corner. Overall, this palette is very versatile and, depending on the use of the liner shade, either subtle or a bit bolder. I can't wait to play around with it more, especially once I have the Anna Sui liner. I should have picked it up when I was in the Anna Sui store in Venus Forts, but I figured if I bought it at my local drugstore, I would get points, which will eventually lead to a coupon, thus I could buy more make-up. But they didn't have it for some reason. :( Anyway, I will get my fingers on it. I also really like the very slim palette this shadow comes in. Very easy to carry around! There is, however, a budget alternative to it. Visée's "Blossom Eyes" palettes, the pink one I have reviewed here, have a blue palette where the main colour, the blue, looked pretty much the same as Coffret d'Or's when I swatched both on my hand in the store, same for the silver. It has 5 shades instead of 3+1, and from my experience with the pink one, which I wasn't 100% satisfied with, I decided not to get it. It was also the full 1.800 Yen instead of the 1.200 I paid for the pink one back then. So, before I bought it, wouldn't like it and end up buying the Coffret d'Or one anyway, I figured I should save the money (!) and buy the Coffret d'Or one right away. Logic, I know. I'm not saying Visée's palettes are bad, and if you are on a budget or only wear blue occasionally, you can totally pick it up. I just deciced to splurge a bit before I go home, and I don't regret it. Are you for the cheaper alternatives or do you splurge sometimes? Update: "A Touch of Blusher" has a review about 04 Peach Beige you might want to read as well if you liked the palette, but not the colour. 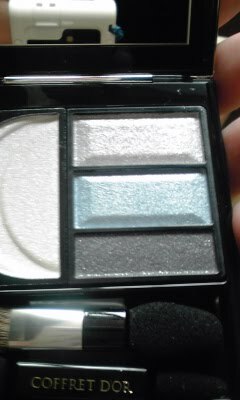 Update 2: Missha's single eyeshadow in blue, which I will review later on, has a similar light blue colour and looks as sparkly as if the silver was already dabbed on it, so if you're more for one colour only, maybe try this one out.